The Sixth Sunday of Easter: In God, we live, and move, and have our being. Today is the Sunday after Earth day. It’s also the Sunday closest to the Rogation days, traditional days when the fields were blessed prior to planting. Today, we remember that the living God has filled the earth with blessing, placing us in the midst of a great community of life, a web of interdependent creatures. Francis of Assisi, that great Christian saint and lover of earth, called these creatures our brothers and sisters, because they reflect the goodness of the Father of Jesus. Our opening hymn is based on Francis’s Canticle of the Creatures. In it, he recognizes sun and moon; water and fire; and even death itself as our friends and companions on our earthly pilgrimage. Throughout his ministry, Francis acknowledged our kinship with animals, pets and predators alike, as he sought to live in peace with all living things. Like God, the environment surrounds us and gives us life. The English word, derived as it is from “environs,” suggests a neighborhood. The Germans have a beautiful word for our environment. They call it the “Umwelt,” literally the world which surrounds us. We depend on this world for all we are and do. Thus, the world is, in a very real sense, like God. The world is a sacrament of God, an effective sign of God’s never failing love for creatures. Or, to cite a common medieval metaphor, the world is a book, like Scripture, which points us back to God. If we listen for God, we discover that every creature sounds its own distinctive note in the harmonious love song of our Creator. Today, after the sermon, youth and children will help lead us in singing Hymn 385, which was originally written in the Dakota Sioux language. This hymn is based on a portion of the tenth chapter of Jeremiah. It is a prayer of the Dakota people in the midst of violence and dislocation caused by white settlers. In the midst of that violence, the hymn affirms the goodness of creation. It leads us back to the Creator, who gives us life and communion with others. It’s important to frame our work for environmental justice in terms of God’s abundant goodness in creation. For Christians, work for any kind of justice must never descend into a joyless moralism. As worshipers of the one God of all reality, we seek community with all people, not just those we deem righteous or holy. We live together under the cross, as those who’ve experienced the power of forgiveness to change lives. The gift of community is central to God’s purposes for the planet. This means community with ALL neighbors, human and non-human alike. Our work to restore creation is a grateful response to God’s goodness, traces of which are found throughout creation and in every human being. That’s not to minimize the ecological crisis, which I believe is nearing apocalyptic dimensions. The desecration of earth, water, and air is made all the more sinful, because these gifts are meant to be instruments of God’s never failing care. But our sense of urgency should never morph into panic or despair. These are just as sinful as the apathy and lust which are devastating the planet. We can respond to this crisis joyfully, because our hope is in God. In God, we have a covenant partner who forgives us and patiently labors with us to undo the damage we’ve done. We rely on the firm promise of Jesus: “I will not leave you orphaned.” Soon, on the Day of Pentecost, we will experience the Holy Spirit—God’s own love—being poured out on all flesh. This love is meant to bind the universe together in communion. It is meant to empower us to turn our lives around and to draw us ever deeper into the life of Christ. Of all the little trees that never grow to be big ones, found bordering our mid-west streams and woodlands, the Bladder-Nut is perhaps the handsomest. It grows straight and slender and trim, and in its long-stemmed, compound leaves and drooping pinkish white flower-clusters there is a distinctive gracefulness which adds much charm to the dainty dignity of its slender growth. I’m quite aware that planting this tree is symbolic. It is not enough. But symbols matter. And I believe this action is a sign of a broader commitment to restoring God’s earth. In every liturgy, we pledge ourselves to a vision of a world not yet fully arrived—that of the Kingdom of God. Here are some other things we have done or plan to do, as signs of this pledge. This summer we are going to insulate the attic above the parish offices and in the Episcopal house. We have begun to look into the possibility of generating all our electricity ourselves with solar panels installed by a local company. Our creation justice ministry is raising awareness of the threat of global warming, and helping those who participate to take large and small steps toward reducing consumption of energy and the production of carbon dioxide. 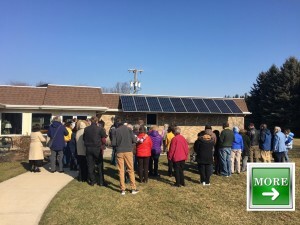 At our diocesan convention last year, we joined with other religious communities in supporting the creation of Ohio Interfaith Power and Light, which will eventually provide renewable energy for our households. There’s another way in which caring for creation matters. Greening the Church is crucial to the credibility of our Christian witness today. You’ll recall from the first reading that Paul told the Athenians that they were religious in every way, because he saw an altar inscribed to “an unknown God.” I believe that, in this city of Athens, and around the world, people, especially youth and college students have a deep hunger for a more just, sustainable world. Without necessarily having an explicit faith in God, they are coming to a religious sensibility about the earth and our place within it. Caring for the earth is a religious act, done out of reverence for the divine goodness which pervades creation and fills all things with life. It is one of many ways God calls us to be reconciled with our neighbors. Implicitly or explicitly, it involves an act of trust in God, especially now, when the future is so uncertain. Paul continued his sermon by proclaiming the God who made the world and everything in it, who gives life and breath to all things. And he went on to proclaim Jesus and the resurrection. In God, indeed, we live and move and have our being. May God’s love for the earth fill us with compassion for all God’s creatures. And may Christ’s victory over sin and death move us, always, to action.